Hey folks - Here we go again. Life has stabilized a bit, my family has moved in with my parents until my new house is ready and we have found some consistency and routine and things are starting to feel normalish again. With that I have decided I am finally ready to get back at blogging and putting together some hobby articles - Hooray! This week I have an amazing new product from my favorite hobby company AK-Interactive. In the past I have shown several of their washes, their sand and gravel fixer (If you haven't got this yet you are just cheating yourself!) and some of their paint effects sets. Well Mig, Iain and the rest of the crew have stepped up once again and are in the process of releasing a whole paint line. 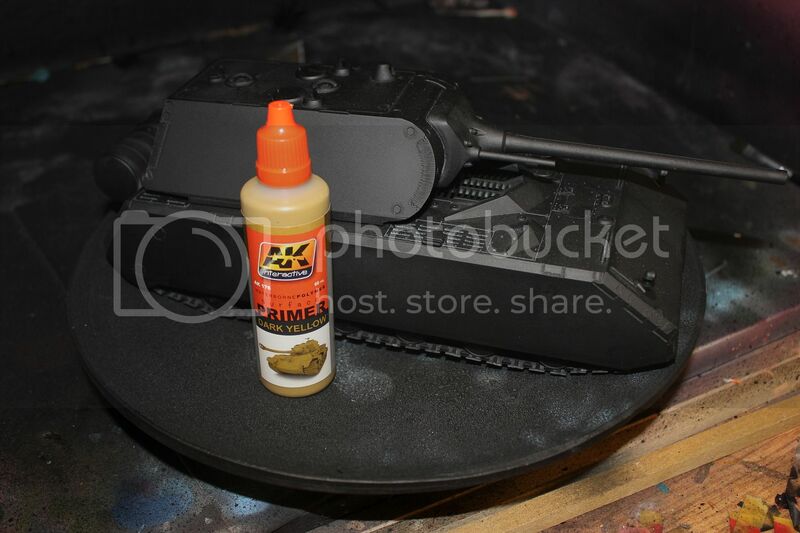 As a part of this is a product that i think is going to be a mainstay of my painting process - AK Primers. These are airbrush ready primers that come in a variety of colours (yeah we spell color with a U here in Canada - no I dont just keep making the same spelling error here.....). So far I have the Dark yellow primer and the grey primer and I decided to give them a spin. This can be really handy as your primer and basecoat can all be a single thinner layer as opposed to one one over the other. 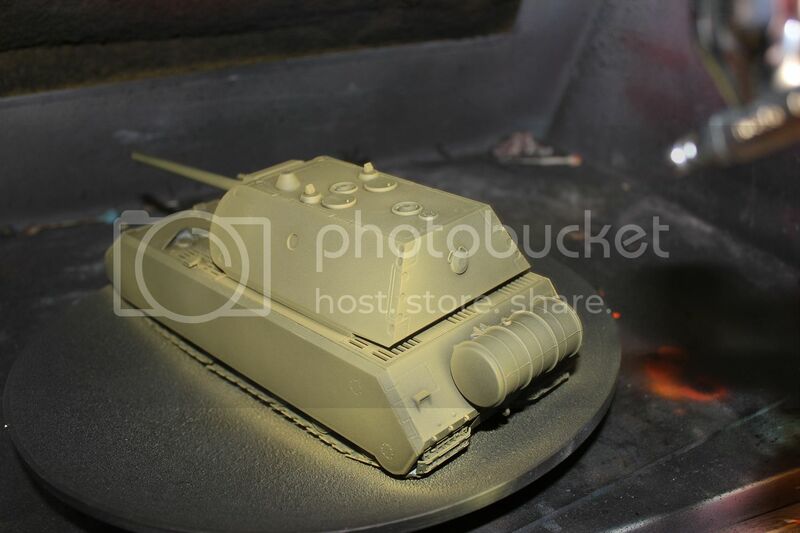 I started with a tank model - the enormous 1/35 scale Maus by Dragon models (comparable in size to a Baneblade but with very large flat surfaces that will show flaws in finishes pretty easily). 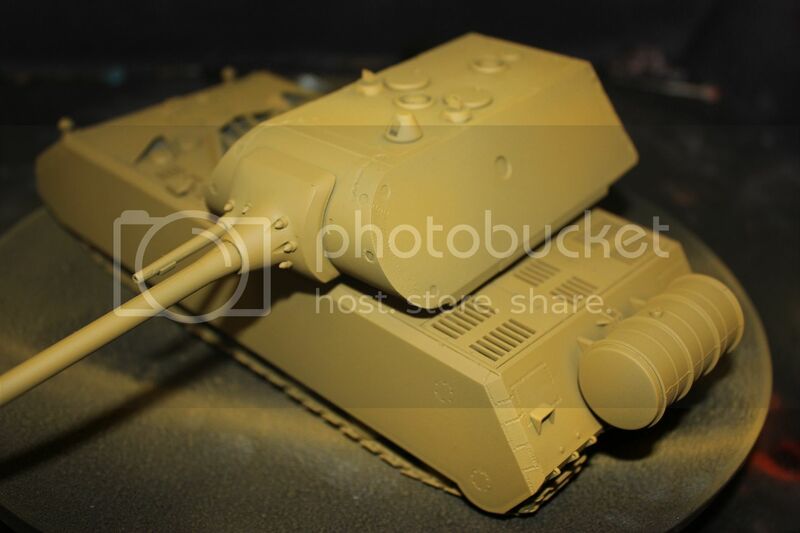 This model should likely be painted in a dark yellow (dunkelgelb) paint scheme. The student who build the kit primed it Chaos black to start with, which in many ways undermines my test of this as a "primer" and how well it bonds to surfaces (I will address this further down in this article) but I figured it would give me an opportunity to check the opacity of this primer coat, particularly in thin coats, and to check the consistency across large smooth surfaces and see what the tooth was like. It covered like a dream. The paint coats flashed quickly (drying across the surface) and blended passes together seamlessly with virtually no effort. The tooth of the paint was very fine and very flat. This is a HUGE advantage over the Army Painter line of similarly coloured primers as they often have an overly slick surface that can be a challenge to paint and weather over and has a much glossier look. The closest comparison to the finish that I can make is Tamiya paint thinned with lacquer thinner. The true difference here is NO LACQUER THINNER. Completely water based it lacks the solvent smell &need for additives and harsh chemicals. So good it has to be seen to be believed. The coats go on extremely thin and cover to opacity quickly and easily. I switched over to some Warmachine models that needed some new paint. I have a PMagnus battlegroup that were in various stages of painting when I purchased them and an additional Talon that I had for the club's other Merc forces. This meant a combo of repaints and bare metal. GREAT! Now we would be able to see how it binds to bare metal and plastic as well as how it covers a variety of colours and older paints (I didn't feel like stripping these first - just refreshing them for the club). Once again, nothing but awesomeness in a bottle. The coats went on easily, flashed completely smooth and hit opacity without obscuring any further detail. The finish is rugged enough that it will hold up well to further painting and weathering without and worry. The same can definitely be said for the bare metal talon that I primed in Grey (I will now use this as the primer and base colour for McBain's battlegroup). The paint clung extremely well to the metal surfaces and, while not as durable as Chaos Black, it does seems rugged enough to use as the base for a gaming mini without fear (airbrushable paints are generally a much more fragile surface - easily scratched and damaged. This seems as strong as a brushable coat when I attempted to scratch/stress it). All in all, a really successful first outing for a new product that will quickly become a staple of my painting kit! Coming soon: More Beastmen, More Magnus, More Terrain, More Reviews (Impudent Mortal Laser Cut Gaming trays! ), More Khador (Battle engine), and Learning to Use Retribution!